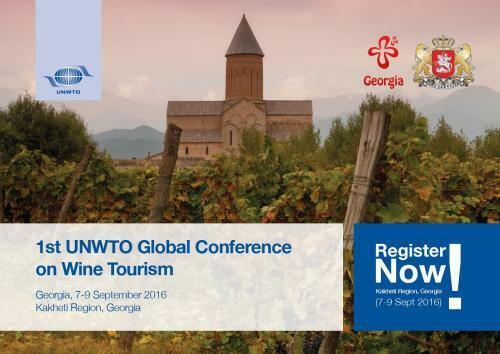 The World Tourism Organization (UNWTO), in collaboration with the Georgian National Tourism Administration, is organizing the 1st UNWTO Global Conference on Wine Tourism in the Kakheti wine region of Georgia on 7-9 September 2016. “Georgia’s unique wine-making traditions date back 8,000 years and are considered by UNESCO as intangible heritage, making the country an ideal host for the Global Conference on Wine Tourism. The country’s recent success in attracting a growing number of tourists, and its development of tourism products, branding and marketing, combine to present an excellent platform for sharing best practices, experience and knowledge,” said Dimitry Kumsishvili, Vice-Prime Minister and Minister of Economy and Sustainable Development of Georgia. “Wine tourism is a growing segment with immense opportunities to diversify demand. In the case of Georgia, the segment’s potential is well known and we are very pleased to be holding the first UNWTO Global Conference on Wine Tourism in the country”, added Taleb Rifai, UNWTO Secretary-General. Gastronomy and wine have become key components of a culture and lifestyle experience of any destination, and a growing travel motivation. To foster the development of this segment, in September 2015 UNWTO launched the UNWTO Gastronomy Network. In this context, UNWTO is currently developing a Wine Tourism Prototype in Spain. The Prototype includes an analysis of wine tourism, in comparison with other tourism segments, and the design of an innovative product development model focused on the integration of the wineries into the cultural, economic, social and environmental heritage of their area of influence. The final results of this project will be presented at the conference. The Conference will have a unique and dynamic format with three sessions to be held in different wineries across the Georgian region of Kakheti. Speakers at the conference will include: Mr. Giovanni Mantovani, CEO, VeronaFiere and creator of VINITALY, (Italy); Ms. Janet Dorozynski, Trade Commissioner, Canadian Wine, Beer and Spirits and Tourism, Trade Sectors Bureau (BBI), Global Affairs Canada (Canada); Mr. Mike Veseth, Wine Economist, Professor Emeritus of International Political Economy, University of Puget Sound (United States); Mr. Gabriel Fidel, Wine Tourism Consultant (Argentina); Ms. Ayana Mizawa, Chief winemaker, Chuo Budoshu Co., Ltd., Grace Wine (Japan); Mr. Pedro Vargas, International Projects Director, Leading Brands of Spain Forum (Spain); Mr. George Chogovadze, Head of Georgian National Tourism Administration (Georgia);Mr. Levan Davitashvili, Deputy Minister of Agriculture of Georgia (Georgia); Mr. Patrick Honnef, Winemaker, Viticulturist, CEO of Château Mukhrani, Georgia (Georgia); Mr. John H Wurdeman V, Owner of Pheasant’s Tears (Georgia); Mr. Santiago Vivanco, Director, Vivanco Museum of Wine Culture (Spain); Mr. Donald Hawkins, Eisenhower Professor, George Washington University (United States); Ms. Paula Sousa, Marketing & Tourism Sales Director, Quinta Nova N. S. Carmo (Portugal) and Ms. Zaida Semprun, Wine Tourism Commercial Manager, Freixenet Group (Spain).